This activity was initially prepared by Marie-Christine Angonin, Jérémie Lasue and Anne-Laure Melchior for students following modules of methodology in bioastronomy, proposed in the 1st year of Licence at the University Pierre and Marie Curie. It is also suited for pupils of secondary schools, but requires to spend a longer period. It has been tested in a scientific workshop (level 5th and 4th -- 12-13 years old) at the middle school named "Vieux Colombier" at Le Mans. It uses the SalsaJ software. Practical works of astronomical imaging. 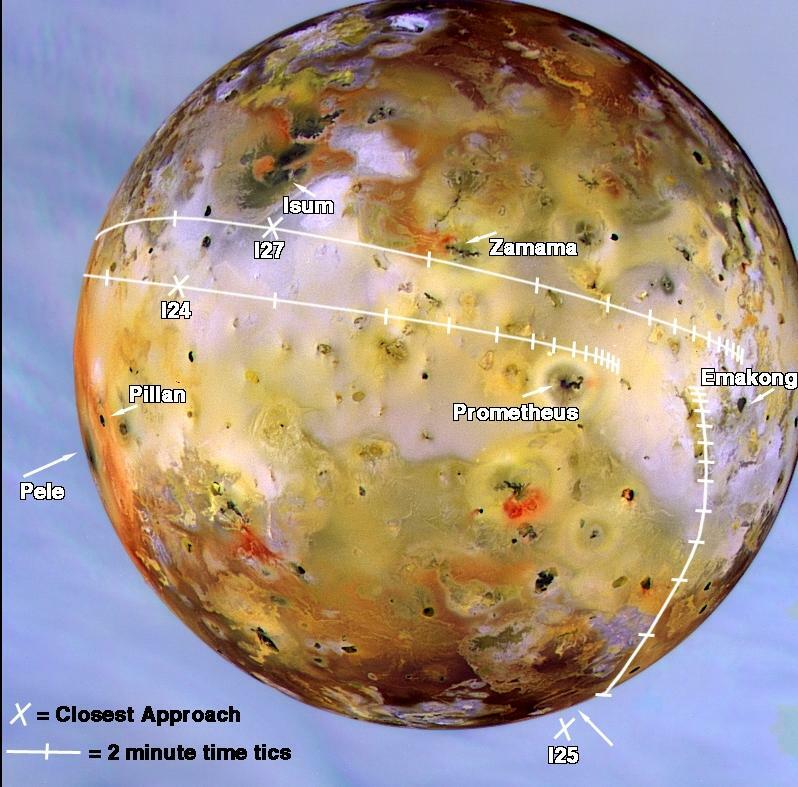 1: Observe the trajectory of the spacecraft, which is observing Io, the Jupiter satellite. 2: Explain the nickname of "pizza-pie of space"
2: Knowing that Io diameter is 3.630 km, determine the height and the extension of the plume of the observed eruption. 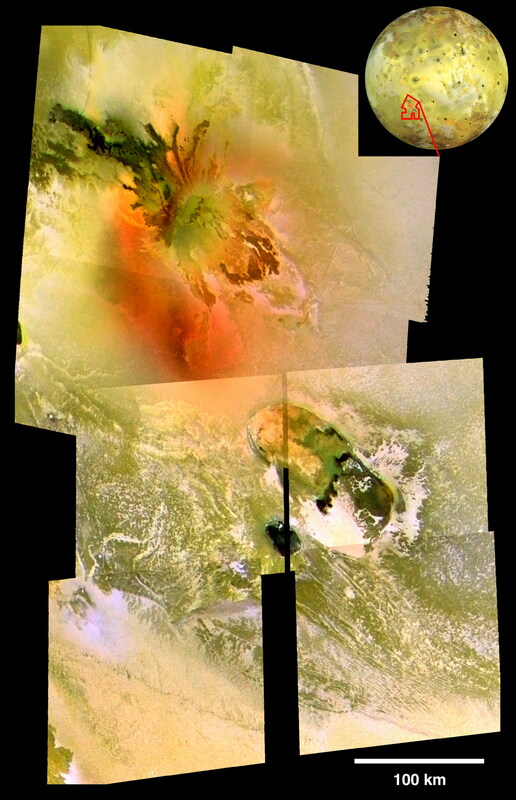 Open image: IO plume1.jpg (credit ESA/NASA). 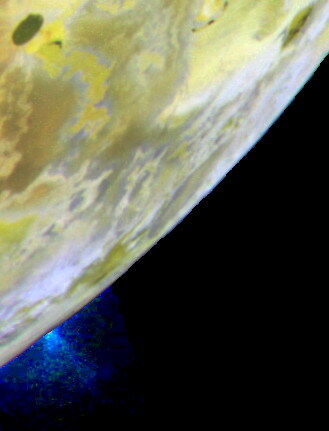 This image (false colors) was taken by the probe "Galileo" on July 3, 1999, at an altitude of approximately 130 km. The resolution is 1,3 km per pixel. 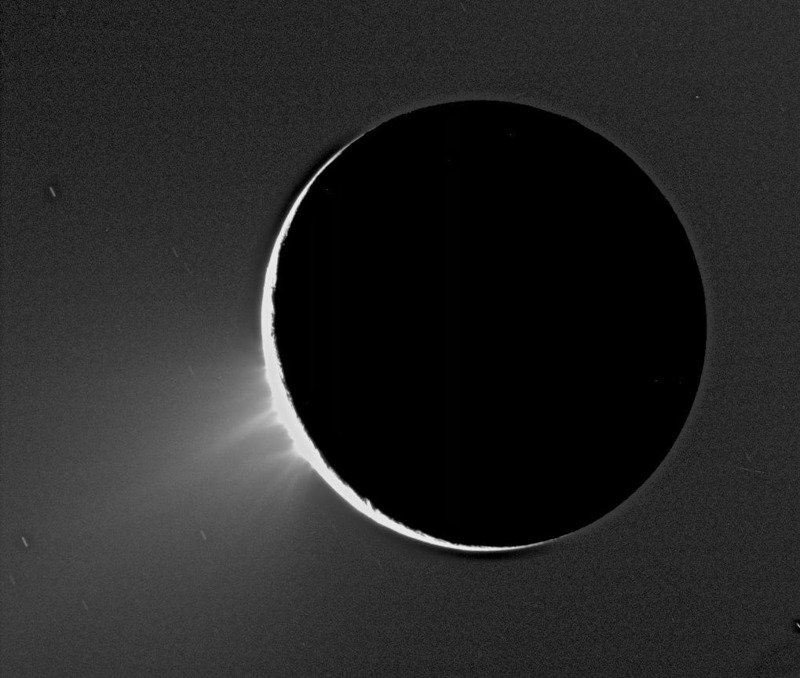 One can observe a gas plume and particles ejected under the effect of the volcanicity of the Io moon. 3: Describe this image. Compare with the preceding one. 4: Determine the height and the extension of the plume of this eruption. 5: Since the volcanos on Earth have plumes which can go up at an altitude of 15-20 km, compare the eruptions on Earth and Io. Open image IO 1.jpg (credit ESA/NASA). 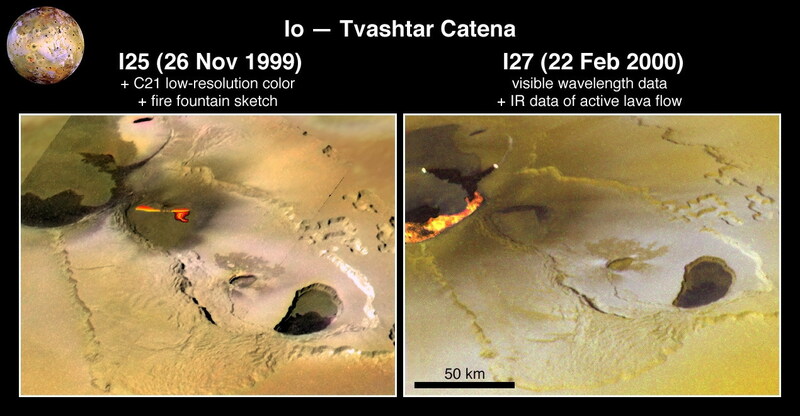 It is about an eruption in an area of Io which was named " Tvashtar Catena". This image shows the quick change of an active lava flow; it confirms this observation, made since the Earth , and allows to suppose: the matter jets seen on the preceding images are well caused by volcanic eruptions. 1: Observe the two images; describe the ground. Explain how the active lava flows evolved/moved between the two dates. 2: Evaluate the resolution of the image of right-hand side. Deduce of it the distance between the two active lava flows. Open the image olymons face.fts (Credit: ESA/NASA.). 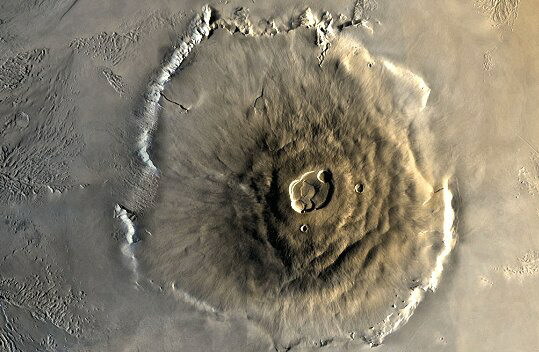 It is about Olympus Mons, largest of the Martian volcanos and also largest known in the Solar system; it is located close to the equator of Mars.Its height is 26.000 m.
2: By observing the indications of size of image (in top on the left), evaluate the resolution of this digital photograph. Then estimate the diameter of the volcano and the size of its caldera (crater). 3: Use the image olymonsprofile.fts to measure the height of caldera. Discuss. 4: Compare with Mauna leasing with Hawaii (alt. 4170 m) which is the largest terrestrial volcano, whose last eruption goes back to 1984. Its measurement is 3km x 5 km for a caldera depth, approximately 180 m.